Michael J. González, N.M.D., D.Sc., Ph.D., F.A.C.N. Dr. Michael J. Gonzalez is Professor at the Nutrition Program, School of Public Health in the Medical Sciences Campus, University of Puerto Rico. He earned a Bachelor Degree in Biology and Chemistry (Catholic University), a Masters in Cellular Biology and Biophysics (Nova University), and another Masters in Nutrition and Public Health (University of P.R.). 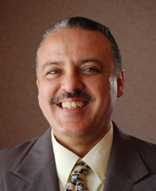 He has a Doctorate in Nutritional Medicine (John F. Kennedy University). He also has a Doctorate in Health Sciences (Lafayette University), and another Doctorate in Nutritional Biochemistry and Cancer Biology (Michigan State University). He completed a Post-Doctoral Fellowship in Geriatrics at the School of Medicine, University of Puerto Rico. Dr. Gonzalez is a Fellow of the American College of Nutrition, and has authored over 150 scientific publications. He has serve as a member on several scientific journal Editorial Boards, such as Biomedicina, the Journal of Orthomolecular Medicine, and Alternative Medicine Reviews. As a consultant for several companies, he has been responsible for designing formulations of nutritional supplements and pharmaceutical products. He has been a consultant for The Center for the Improvement of Human Functioning (now Riordan Clinic), in Wichita, Kansas. He has obtained several research awards for his work on Nutrition and Cancer. He is currently Co- Director of RECNAC II project, and Research Director of the InBioMed Project Initiative. Dr. Gonzalez also serves as a nutrition consultant to the Puerto Rican Basketball National Team and is part of the Medical Commission of the Puerto Rican Basketball Federation. Doctor González and Dr. Jorge Miranda-Massari, founders of InBioMed, are leaders in the development of non-toxic chemotherapy treatments for cancer. The findings of their work with Intravenous Vitamin C as an anti-cancer agent, published in 2002, were confirmed by the NIH in 2005. They published the first Phase-I clinical study utilizing Intravenous Vitamin C for treatment of terminal cancer patients in 2005, and also published in 2005 the most comprehensive review on Vitamin C and Cancer, as a follow-up on the work of two times Nobel Laureate, Dr. Linus C. Pauling. They have brought many new concepts into the field, such as the Bioenergetic theory of carcinogenesis, the systemic saturation phenomenon of intravenous vitamin C, the metabolic correction concept for disease treatment and prevention. Book: Doctors Gonzalez, Miranda-Massari and Saul’s book I Have Cancer: What Should I do? : Your Orthomolecular Guide for Cancer Management (2009) provides evidence based recommendations for an integrative approach for those dealing with cancer and seeking to improve quality of life and survival. Main Research Interest is the development of effective, non-toxic treatments for chronic diseases, especially cancer. Changing the biochemical conditions that promote, develop and sustain the malignant state can produce inhibition of malignant cell proliferation, increase aerobic metabolism and achieve re-differentiation. We are also interested in the development of non-toxic therapeutic strategies that enhance the effectiveness of other treatments or that reduce their toxicity. Ascorbic acid, lipoic acid, acetyl L-Carnitine, Coenzyme Q10. Over 150 scientific publications including editorials, reviews and research data in peer review journals and one book. Ascorbic Acid, Mitochondria and Cancer: The Energy, Metabolism and Carcinogenesis Relationship. Journal Orthomolecular Medicine; 2010. Pharmacokinetics of Vitamin C: Insights of into the Oral and Intravenous Administration of Ascorbate. PRHSJ 2008;27:7-19. A pilot clinical study of continuous intravenous ascorbate in terminal cancer patients. PR Health Sci J. 2005;24:269-76. Nutritional Oncology Review: Ascorbic Acid and Cancer: 25 years later. Integr Cancer Ther. 2005;4:32-44. Book. I Have Cancer: What Should I do? : Your Orthomolecular Guide for Cancer Management (2009). Over 150 presentations mostly to health professionals (physicians, pharmacists, nutritionists and medical technologists). Co-Created of the first course in Integrative Medicine at the University of Puerto Rico.